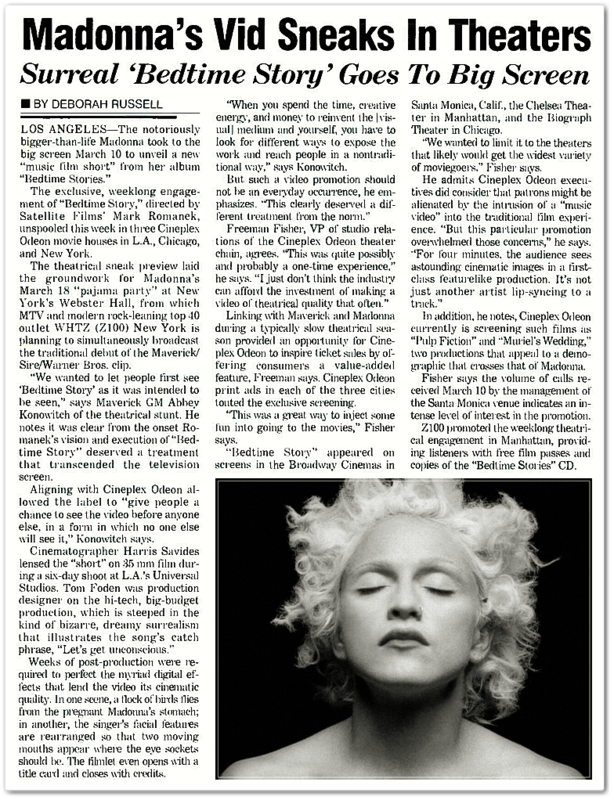 On March 25 1995, Madonna’s Bedtime Story music video was featured in an article in Billboard magazine. The article focused on Warner’s decision of previewing the video in movie theaters, which was a new marketing strategy that had not been attempted previously. 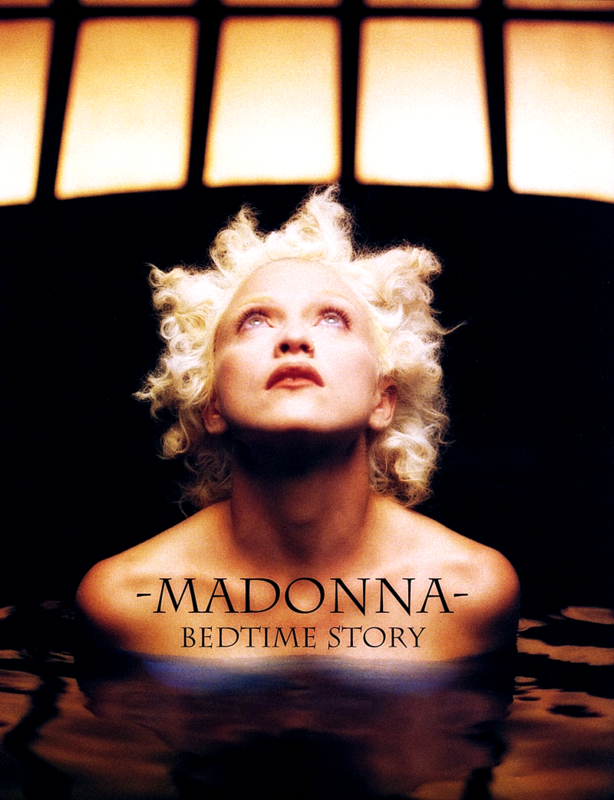 On December 5 1994, Madonna began filming the music video for Bedtime Story at Universal Studios in Los Angeles, CA. The video marked her second collaboration with director Mark Romanek and featured cinematography by Harris Savides. 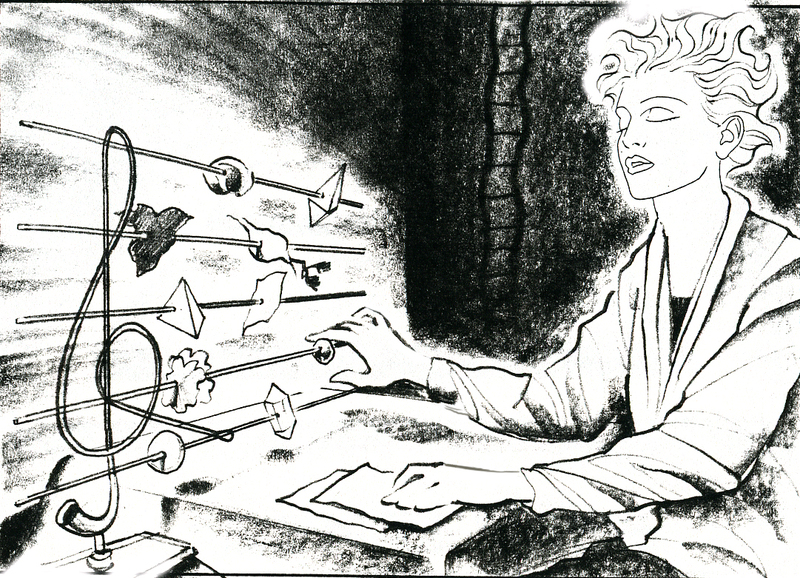 To assist in the process of developing her ideas for the video into something more tangible, Madonna again turned to storyboard artist Grant Shaffer, who had previously collaborated on her videos for Deeper And Deeper and Rain. 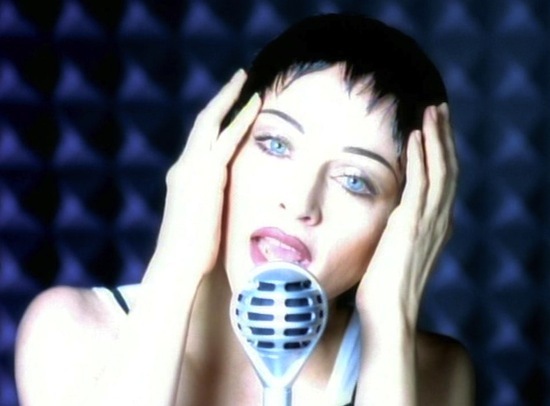 The effects-laden video was shot over six days and has been noted by Madonna as being one of the more grueling video shoots of her career. 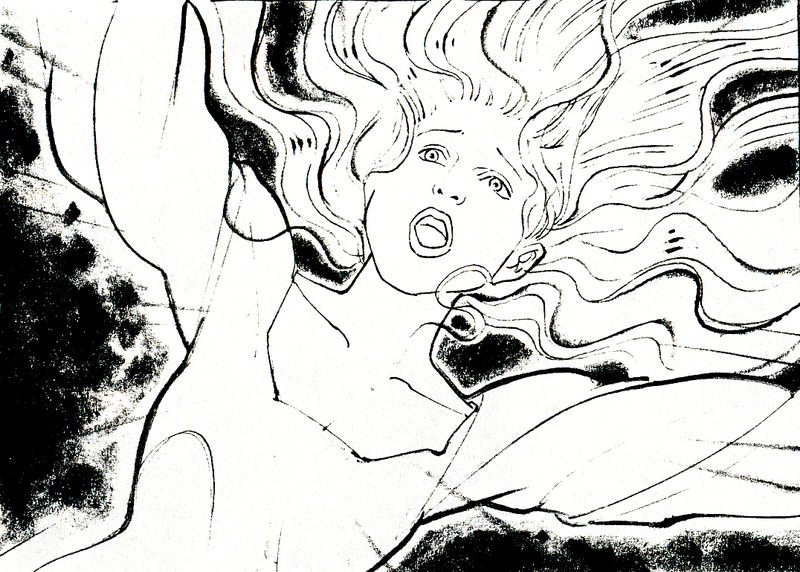 Filming of a scene that featured Madonna bathing in blue-coloured water yielded unexpectedly colourful results; when Madonna emerged from the water, she later recounted, it quickly became apparent that her skin had been temporarily stained blue. 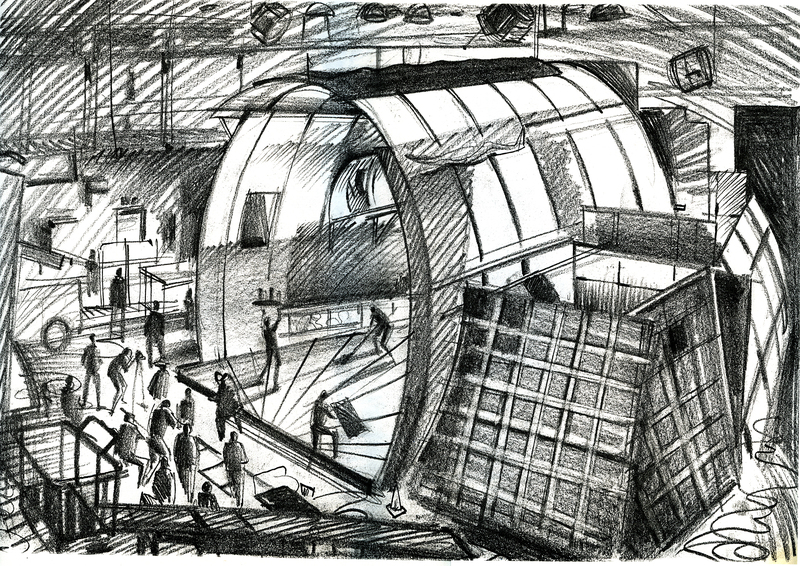 Fortunately any on-set difficulties were not evident in the final product. 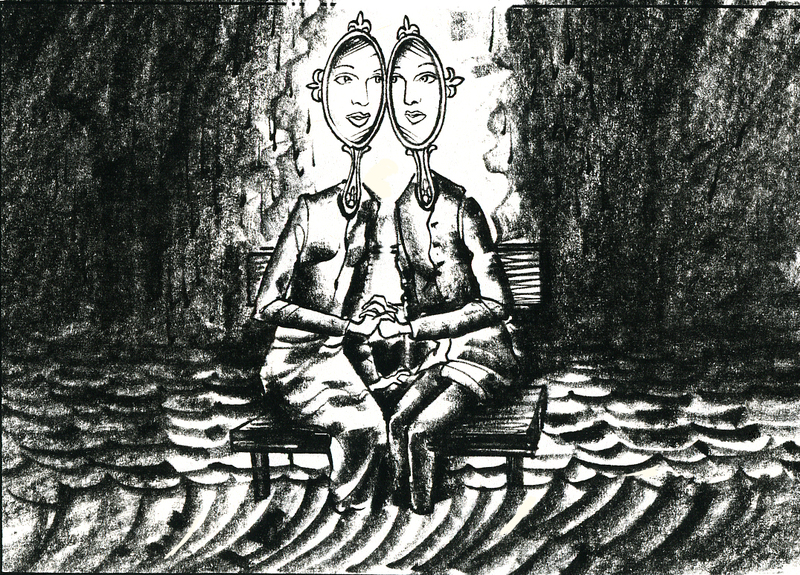 Following several months of post-production work, the video’s stunning surrealist imagery was enthusiastically received by viewers upon its release in March, 1995. 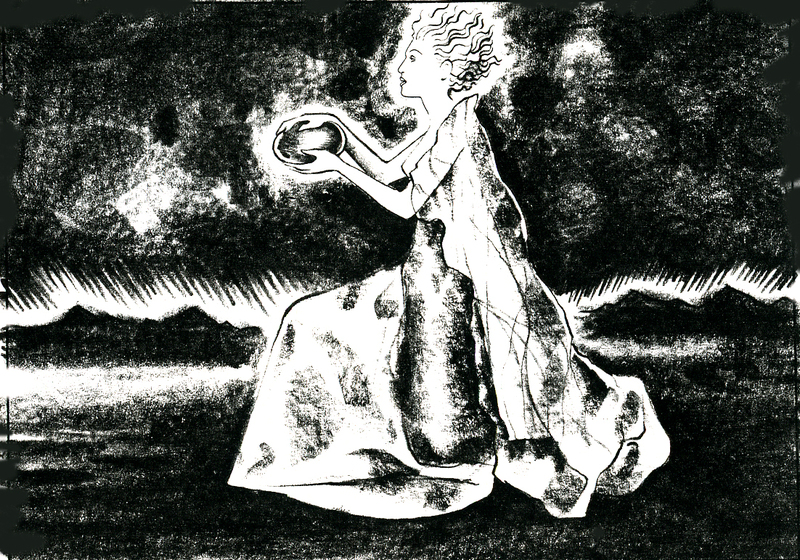 A very special thank you to artist Grant Shaffer for generously sharing a selection of his original storyboards used in the development of the Bedtime Story video! 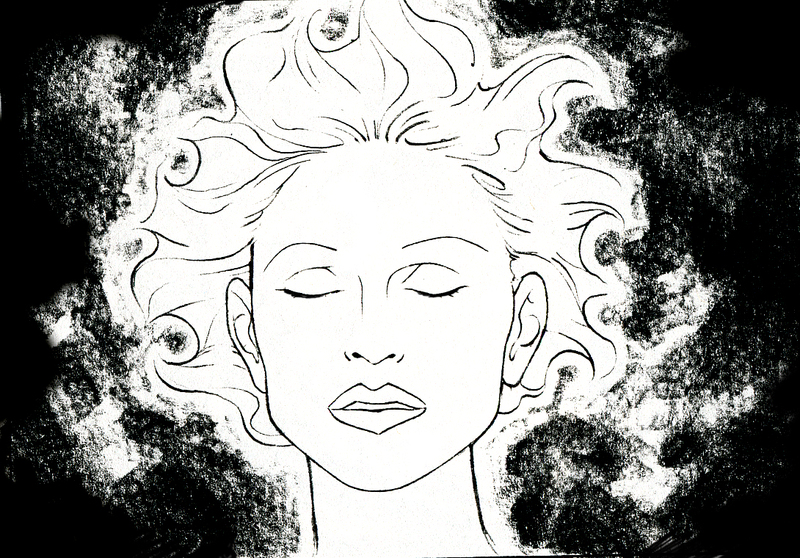 We’d like to invite readers to check out more of Grant’s art on his official website – including his sketches for Deeper And Deeper, Rain and Madonna’s Japanese Takara commercial. 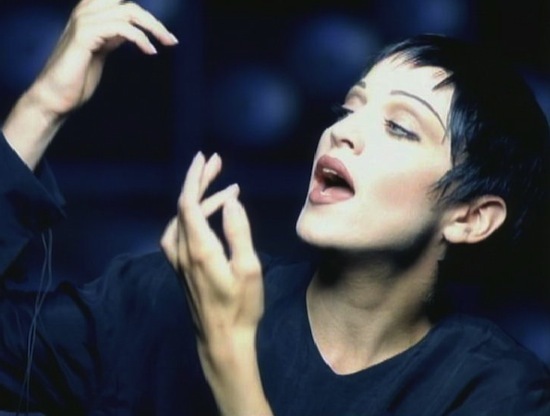 On November 27 1999, Madonna: The Video Collection 1993-99 hit #3 on the Billboard Top Music Videos chart. 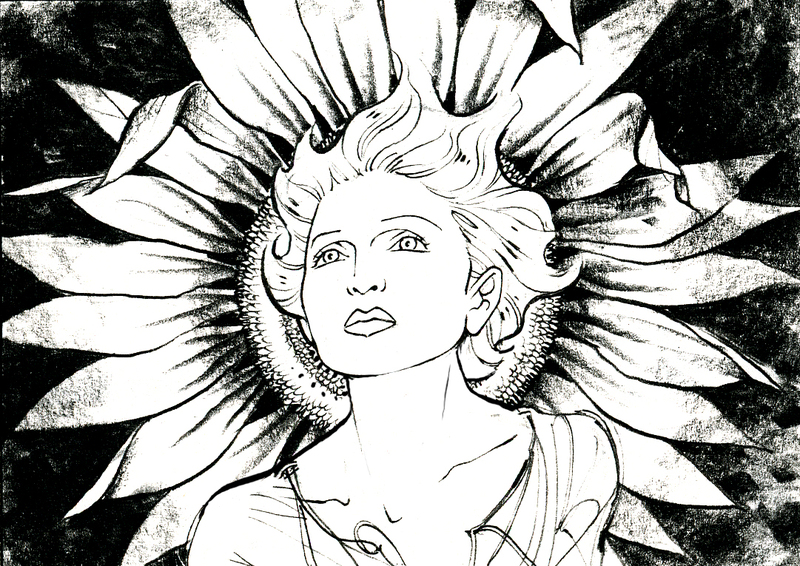 One rarely finds the use for such adjectives as “Zen-like,” spare, and sentimental in describing an outrageous, outspoken, and extreme performer like Madonna. Yet the artist’s new Maverick -Sire-Warner Bros. video “Rain,” directed by Mark Romanek for Satellite Films, conjures those very images against the understated elegance of a tenderly soothing ballad. 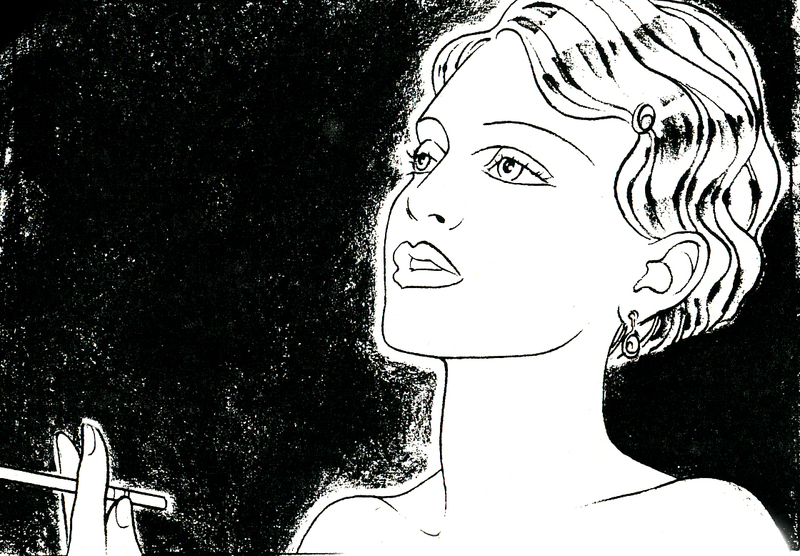 The result is a Madonna who is chic yet vulnerable, glamorous yet sweet. “The contradiction you face in shooting a Madonna video is that people expect something rather grand from her, and yet the feeling of the times is that things need to be simplified and stripped away,” says Romanek. 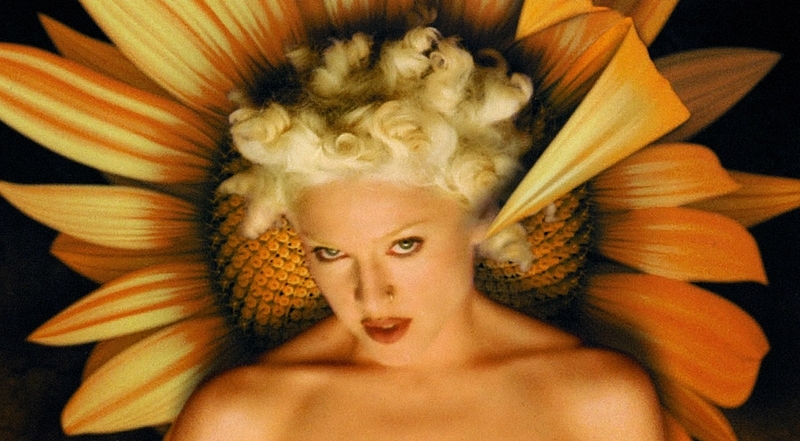 The director admits he was a bit intimidated by the prospect of shooting a video that would mark a departure from Madonna’s ostentatious antics of the past. 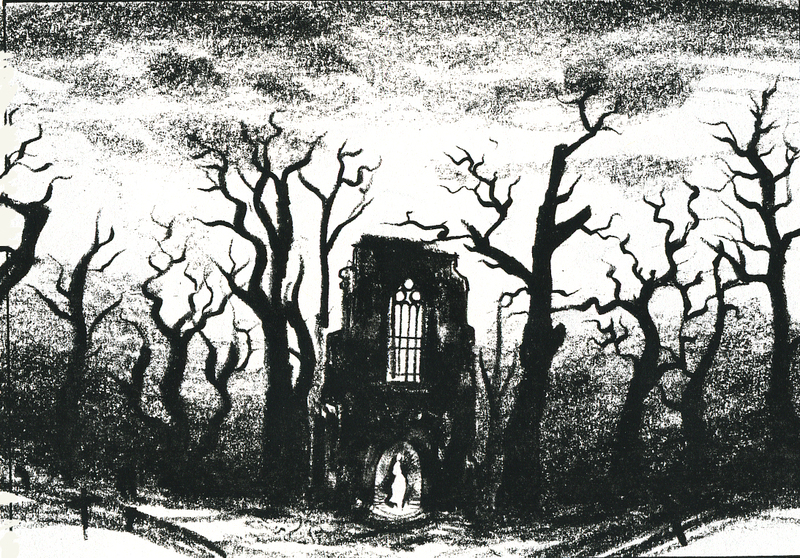 “The song is a bit sentimental, and you just can’t do something psychosexual and subversive with it,” he notes. “My challenge was to come up with something that seems glamorous and expensive, yet is spare and Zen-like at the same time.” Romanek chose to interpret “Rain” as an exercise in media manipulation and image-making. 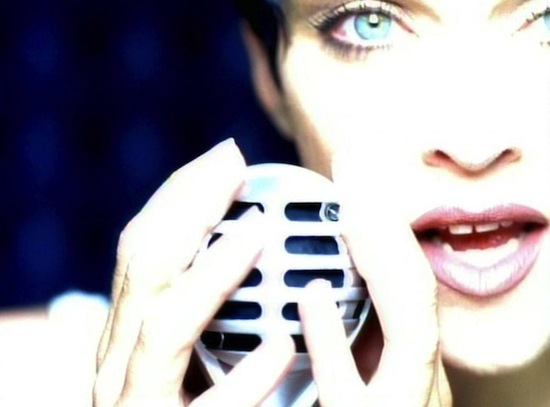 The clip is reeled as a video-within-a-video, as Madonna, the doe-eyed ingenue, performs for a Japanese film crew. 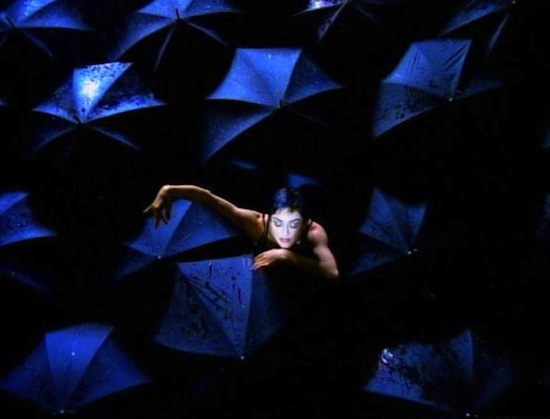 The Satellite crew spent four days making sure such aesthetically correct shots would work, including a windswept storm sequence on a stage, and an overhead shot of Madonna surrounded by a bed of open, black umbrellas. In nearly every shot, the graphic image is so compelling that the camera need never move. Romanek, a founding director of Satellite, shares credit for “Rain” with producer Krista Montagna, stylist David Bradshaw, and editors John Murray and Jim Haygood. The clip’s cinematographer Savides and art director Jan Peter Flack have been nominated for an MTV Video Music Award. 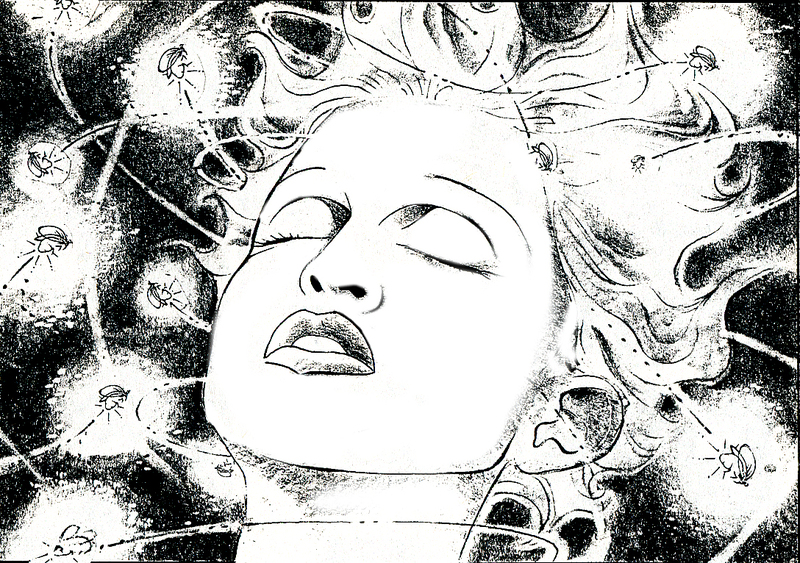 On June 21 1993, Madonna’s Rain video premiered on MTV. The video was directed by Mark Romanek, and filmed from May 16 – 19 at an airport hanger in Santa Monica, California. 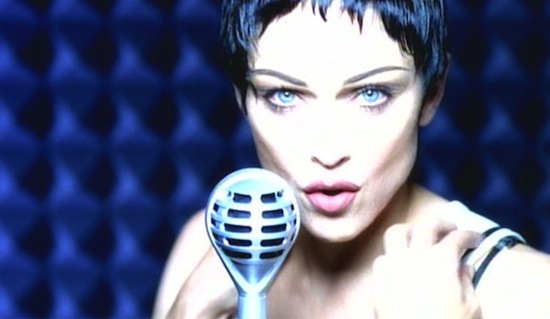 Romanek and Madonna set the video to look like Ryuichi Sakamoto was directing it, giving it a backstage feel. 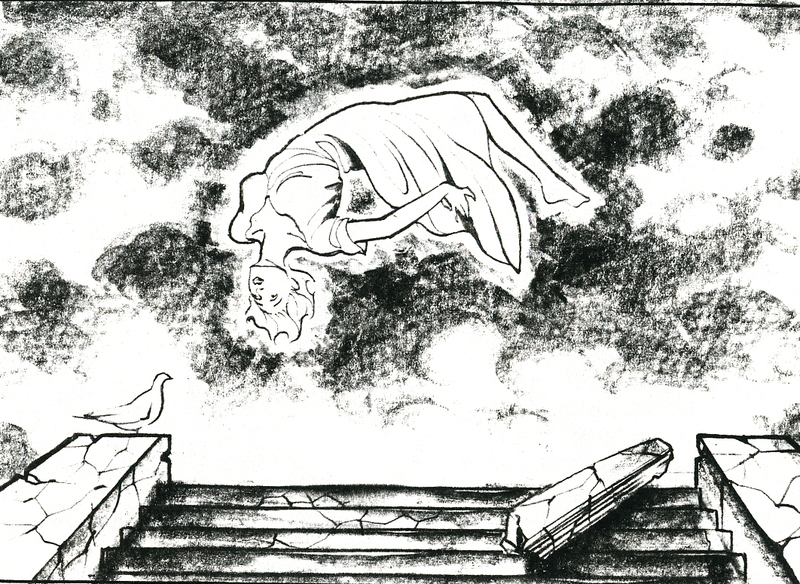 It was entirely shot in black and white and then hand-painted with blue tones. 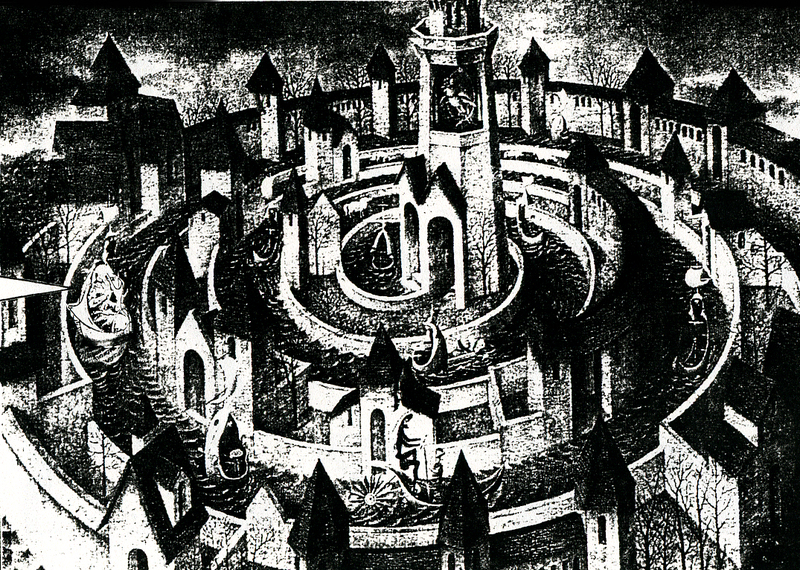 The one week engagement allowed attendees to enjoy the Mark Romanek directed masterpiece on the big screen for a week before the video was released on MTV. 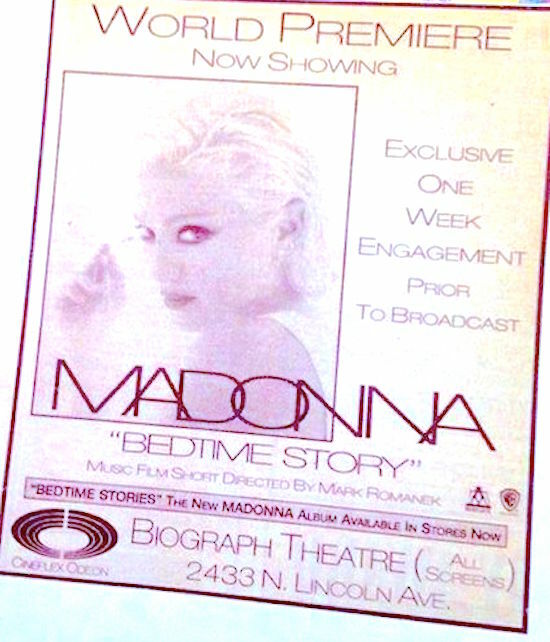 Madonna later celebrated the premiere of Bedtime Story video by throwing a Pajama Party at Webster Hall in New York, on March 18, 1995.